Some people have wild parties for their birthday or go out for dinner, movie, and maybe see some music. Not my Jeff; it was a quiet night with the snakes for him. We set out after work to check on our friend Bane (adult male Arizona black rattlesnake), who was last seen headed toward Secret Springs. 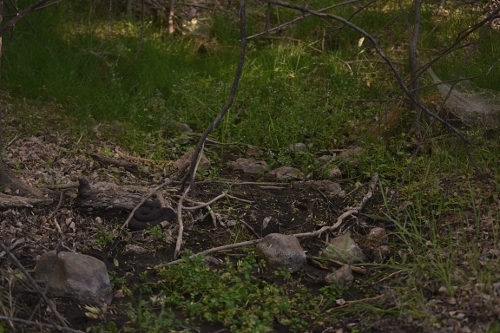 At a bend in the nature trail we call snake corner, we encountered a western diamond-backed rattlesnake. Jeff actually walked right by him and I stepped right in front of him before I noticed him. The snake didn’t seem to care: he never rattled and of course didn’t strike, as that is their last line of defense. 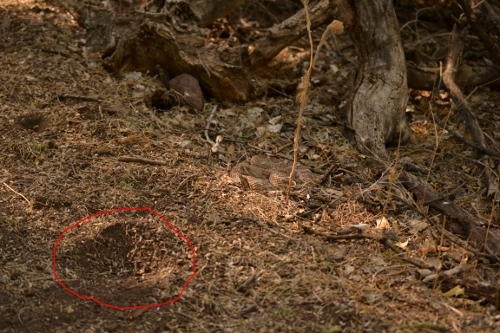 That is my footprint circled in red on the left (snake just off trail on the right). We encountered another western diamond-backed cruising around Secret Springs, looking freshly shed. 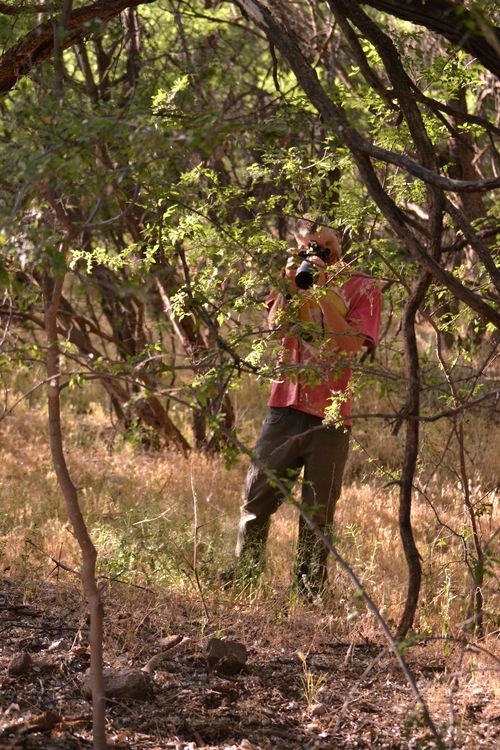 The birthday boy photographing the gorgeous snake. And Bane was nearby in a swampy area, in one of those perfect hunting postures, in the mud, against a downed log. After our snake walk it was time for homemade pizza, garden salad (from our garden at Muleshoe), and raw coconut lime pie. A delicious ending to a delightful birthday. 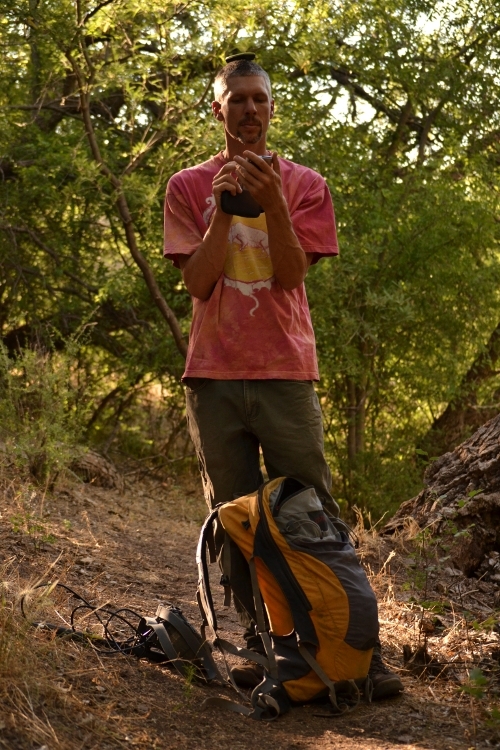 Especially of late, this blog appears to be mainly about me and my adventures with rattlesnakes. But none of this would be possible without my fantastic partner in crime, who is just as crazy about snakes and nature as I am (maybe even more so). 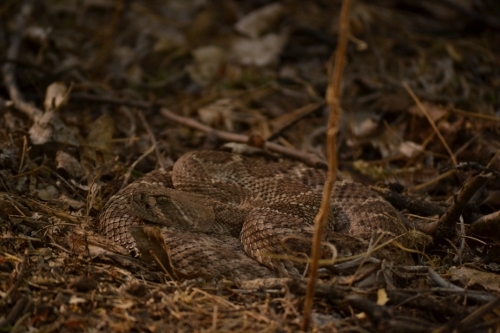 This entry was posted in Uncategorized and tagged bane, western diamond-backed rattlesnake. Bookmark the permalink. Oh I love the GPS pic! Thanks for reading our blog Sylvia! We hope you make it back out here someday. Hi Jeff, I just found your website. 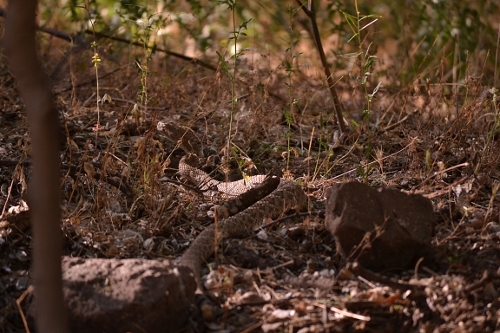 I haven’t read it all yet because I am so excited to share my rattlesnake encounter just a few minutes ago. I live in Golden Valley Arizona, way out on a dirt road. I have two rattlers who live on my property, with no problems. I have many stories about these two tenants. I recently witnessed one of them, over a few days, strike at and miss its prey. One being a bird and one a ground squirrel. This morning I witnessed the two snakes mate. I have pictures!!! unfortunately my camera focused on the Bird of Paradise tree that was right in front of them, so snakes are a little blurry, but you know what they are doing. Please let me know if you want to see them and I have other photos of them eating . If you need a place where you know you’ll see rattlers, your welcome to come join me in my observations in my back yard. I’d love to share my interest in them. We’re so glad you found us. Your ‘neighbors’ sound awesome and we’d love to see photos! If you’re on facebook, feel free to share them on our page at fb.com/socialsnakes or email them. You might also want to check out our new website and blogs at socialsnakes.org – we’re no longer updating this one, but the same sort of content can be found at the new site. Thank you for your fast response. I will check out the new website and post on your Facebook. I love photography so it’ll hurt slightly to post photos when the main characters are blurry, but I dared not get too close because I did not want to miss their actions. Although they never rattle at me when I walk right past them, I didn’t want to chance it on this special occasion.